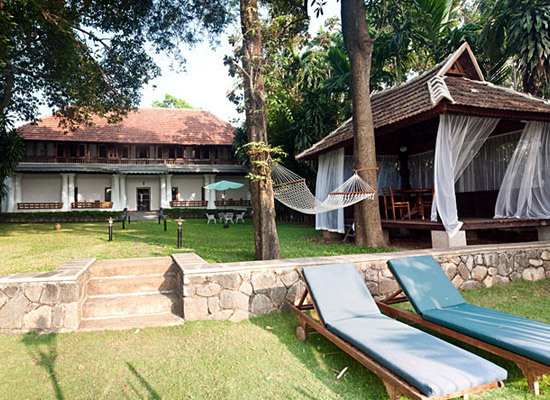 "Heritage hotel in Kerala, Chittoor Kottaram is an amazing picnic destination for couples, friends and newlyweds. There is only a single key for both the rooms and the hotel can accommodate only one single party of maximum 6 people at a time. If one wishes to enjoy a spectacular time with their loved ones and companions, this is the place where they should stay. The spectacular views outside, the historical interiors inside and the numerous entertainment activities make this secluded hotel an ideal place to stay. 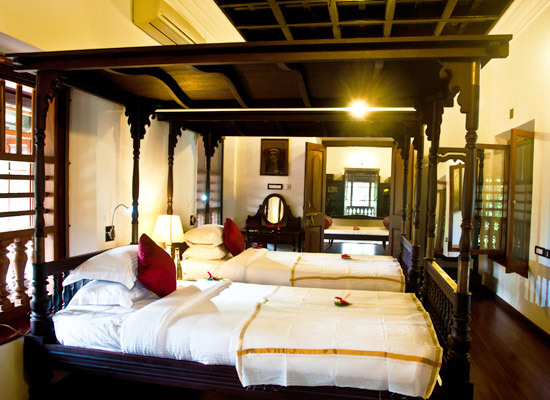 Chittoor Kottaram was constructed as the residence for Raja of Cochin. It is believed that Raja of Cochin lost his territories and was outcast from his own lands. He moved to Tripunithura but his pride was wounded badly. He decided that he would construct a temple in his new territory which would be qual in stature to Guruvayoor temple. After few years, with utmost dedication, “Chittoorappan temple” was constructed dedicated to Lord Krishna. For the convenience of Raja, a palatial building nearby the temple titled as Chittoor Palace”, so that Raja of Cochin can visit the temple on a regular basis. There are only 2 rooms in the hotel. Both the rooms are located very close to each other. They are designed and constructed with utmost aesthetic sense and deep architectural insight so that one could be stunned with the elegance of the rooms. 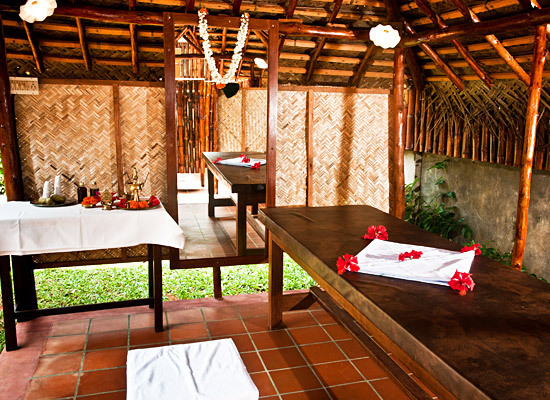 For one’s comfort and luxury, numerous amenities are provided in the rooms. 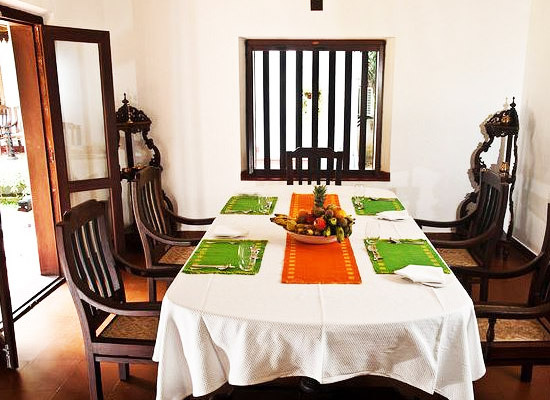 The hotel has a large dining hall where the guests are offered traditionally cooked Kerala food. During lunch, the Plantain leaf tradition of Kerala is followed and the guests enjoy "Sadya" which is food served on leaf. During dinner, guests are served a meal platter titled as "Silver Thali" which consists of home-cooked Kerala food. There is a reason why Kochi was voted as the sixth best Indian tourist destination by Outlook Traveller magazine. The historical city, which existed in the 14th century as the major spice trading port, is gorgeous and captivating in every sense of these words. 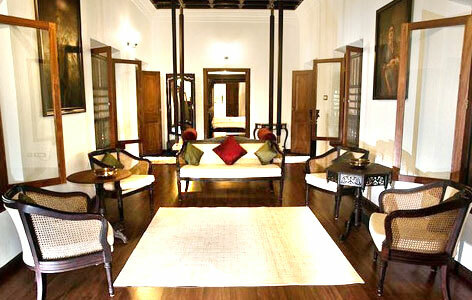 Visiting Cochin is an experience of a lifetime as one could simply relax in here amidst amazing surroundings. 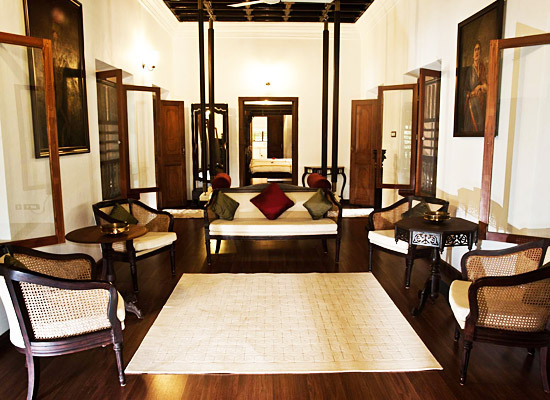 On a tour to Cochin, one should definitely check out the historical lanes of old Fort Cochin as they are marvelous.